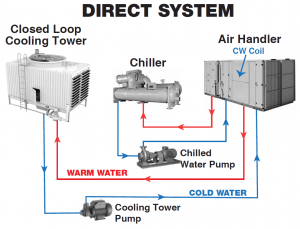 HVAC Cooling Towers are generally put in two distinct classes, Direct and Indirect. Direct towers are considered enclosed systems which have an internal distribution system for the warm water to pass through, to remove heat. Direct towers are also referred to as an Open tower. These type of systems allow the water to come into contact with outside air (‘directly’), as opposed to a closed system, allowing the possibility of contaminates entering the system. An ‘open circuit system’ like this is an enclosed structure that distributes the heated water over packing, or fill, which provides an expanded air-water interface for transferring the heat of the air, and allowing it to cool by evaporation. The water is cooled as it passes through the system and is then collected. This type of system has some loss of water, as the heated and moisture filled air leaves the system and is discharged into the atmosphere. It is also possible for pollutants to enter into the water in a direct system so it must be filtered out. Some means of dissolved solid removal is often used, such as a blow down, which drains off a small percentage of the flow to aid in the removal of these contaminants. This is procedure is not as efficient as filtration however, which is generally the best way to protect the quality of the water. Open cooling towers expose the water directly to the atmosphere, which is the source of the name, and of possible pollutants. The main alternative system, and one required for Hospitals and similar installations that must prevent contamination of the water is a closed or “Indirect” System. Read more about them here.